My cousin and his family, the ones responsible for Ryan and me meeting, have come up to the Northwoods to celebrate New Year’s Eve with us. They arrived late last night. Just before we all retired to our beds, the men told us we needed to get up nice and early for the Big Surprise they had planned for us. This morning it was revealed we were going ice fishing. Interesting choice of activity for four adults, two toddlers, and one infant, none of whom had gone ice fishing before. It was pouring rain outside, too. Clearly, there was something fishy going on. Why did we need to be there at 9:00 AM sharp? Ice fishing doesn’t seem to be that punctual of a sport. And why were all the efforts to get fed, dressed, and out the door on time only geared towards the (adult) women? L. and I were shoved out the door at 8:40 AM with an address written on a piece of paper, our gps with English accent Penelope, and a cup of coffee for the road. Once programmed, Penelope took us straight to the Woodwind Spa just outside of Rhinelander, hidden in the woods. We were treated to an hour long full body massage, a foot reflexology treatment, and sacral/cranial alignment with reiki. Almost five hours later we left the spa again, fully relaxed, body and soul perfectly content. Needless to say, L. and I loved ice fishing. You can take us out anytime! We finally finished trimming the Christmas tree last weekend. With the sounds of the season setting the mood, Ryan, Lola, and I hung every last ornament found in the Christmas boxes that have been packed away for so long. We have an eclectic mix of old and new going on. Mickey, my very first ornament from my grandfather's store, handmade felt and woolen ornaments made by Ryan's grandmother, Dora the Explorer ornaments picked out by Lola, and quite a few Santa Clauses from my ever growing collection. I love our tree. It is past and present blending together in the most colorful way, to become part of our young family history. 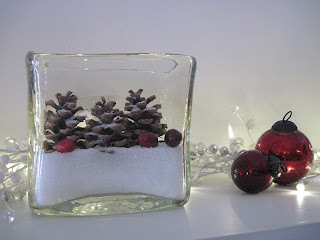 I am linking up to Cheri's ornament party at Its So Very Cheri. Green Girl in Wisconsin was up and outside before the crack of dawn yesterday, marveling at the beautiful sky, watching the stars fall to the earth. She witnessed the peak of the Geminids meteor shower. 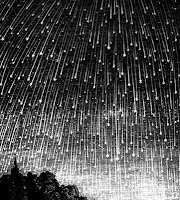 When I commented I wish I had known, she replied the meteor shower can be seen all week, but best before dawn. I got up at 5:30 this morning. After making coffee, I was ready to go outside. It was -16 degrees (-26.7 C). Bundled up with a warm cup of coffee in my hands, I stood in the driveway and looked up at the sky, wishing for a falling star. But not for me, not this time. There was too much light around me reflecting on the snow: street lamps, Christmas decorations, and other sources. I could barely make out the handle of the Big Dipper and the only bright star was the North Star, remaining steady in its place in the sky. If all had been quiet, it would have still been entrancing. But that loudly beeping truck just down the street took all the magic out of the moment. And did I mention it was really cold? I scratched the car. Not the older hand-me-down Nissan, of course. No, the new car, Big Blue. And I scratched it good. In a way it's a relief that the first nick is there, it takes the pressure off driving in a brand new car. But I am really bummed that I am the one who did it. Naturally, it's not my fault. First off, there's the design of the garage. It is obvious the garage was added on at a later date and the only place to put it was behind the house. To get to it, we drive down the narrow driveway alongside the house and make a ninety degree turn at the end. Not the easiest thing to do without room to manoeuvre. We back the Aveo in by driving onto the grass and then putting it in reverse, taking care not to hit the big pine tree that lives there. The Nissan pulls forward into the garage and parks diagonally. A very tight fit but we have been practicing and it was working. Until someone built a snow fort at the end of the driveway. Right where I pull onto the grass. There is barely any room now to pull forward without hitting the six feet high, solid mass of snow or that tree that won't budge. Let alone enough space to make my turn when backing the car into the garage. I ended up just an eighth of an inch too far to the right. Like I said, clearly not my fault. Earlier this year, in the summer to be precise, I made Christmas ornaments for all of my staff at the casino. In the spirit of Christmas, I whipped up another batch this weekend for the entire Marketing department. 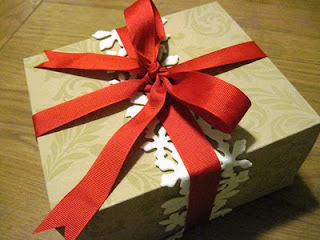 And made my own gift wrap, too. It's my new thing. Really people, what's the excitement? I have never experienced a blizzard. Not in Holland, not during the two winters I lived in Massachusetts, and certainly not in western Washington. I had high hopes last year for my first northern Wisconsin winter, but alas, it was a record breaking mild one. and drifting and near blizzard conditions Saturday night and Sunday. wind chills Sunday night and Monday morning. travel should be postponed until the storm has passed. Will I finally get my blizzard? Probably not, but it will be close. The casino's General Manager sent out a memo today advising team members working this weekend to pack an overnight bag and plan to stay at the hotel if they live more than 25 miles away. My morning cannot start off properly without a cup of coffee. I used to drink out of European sized glasses and cups, i.e. small. I even brought my own when I moved to the United States because the American motto of "bigger is better" was not mine. I was very attached to my small drink ware. But like so many things, I have Americanized in this aspect as well. I now drink my coffee and other beverages out of giant mugs. Except I don't view them as such, they are perfectly normal sized to me. To prove it, I give you this year's Christmas mug. Every year I purchase a seasonal cup at the Goodwill or another thrift store, just for me. And every year they get bigger. Somehow they only last for one season, but that's okay. I'll find a new, bigger, one next year. Lola discovered the convenience of toilets many months ago, but at night she still sports a pull-up. We were almost ready to give those up as well when we moved to Rhinelander and the nightly flow started back up again. And I was so looking forward to not having to buy diapers again. Alas, not just yet. She would, from time to time, tell me she didn't want to wear diapers anymore. After all, she is a big girl now and none of her friends at school wear diapers either. (Apparently that is what toddlers talk about when they're by themselves.) I would answer her that I would be happy to put the pull-ups away if she was able to keep it dry. I know she can do it, because nine out of ten times when she crawls into bed with me in the wee hours of the morning, she is still dry. She is just a little lazy about going potty in the morning and when it's time to get up, she's wet. She must get this laziness from her parents because last night at bedtime, when we realized we were out of pull-ups, we did not run to the store that is a mere five minutes away. Too late, too cold, too lazy. Instead we asked Lola if she was up to the task of not wetting her bed. Of course she was, she assured us. We happily chose to believe her. She almost succeeded. At 1 o'clock this morning, she woke me up to inform me she had just gone potty. Wonderful! When I took her back to bed, I noticed her pyjama pants were a little bit wet. I took that as a good sign because peeing had apparently woken her up. Fresh jammies and back to sleep she went. At 5 o'clock she was back by my bedside, this time naked from the waste down. Again, she had gone potty in the bathroom, but there was a fairly big wet spot in her bed as well. So, first thing this morning I was stripping her bed and doing laundry. That's what I get for not running to the store last night. I think I am going to tough it out for a little bit and not give in to the urge to buy pull-ups because I think this might be a good way to learn. And 5:30 AM is as good a time as any to do laundry, don't you think? 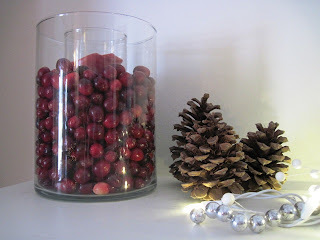 Cranberries, pine cones, and epsom salts: mixed in with a few odds and ends and a string of lights, they make for lovely Christmas decor on our fireplace mantel this year. And since our Christmas tree is very large and colorful, I kept the mantel simple and white with a touch of red. The lovely ladies at Twig and Toadstool picked me as the winner of the beautiful handmade gnome home and gnome give away last week. It is so much fun to open a post in your google reader and see your name in great big letters. Thank you, Maureen and Shanti! Grandma's Briefs is sending me a parking target, another blog give away. Perfect timing because we have just started parking the cars in the garage and it's a very tight fit, I tell you. Thank you, Lisa! It took me more than a week and several trips to Home Depot, but we finally have a lighted Christmas tree. I have strung up 900 lights over the past few days. The tree is bigger than I thought. I wonder if we have enough ornaments? 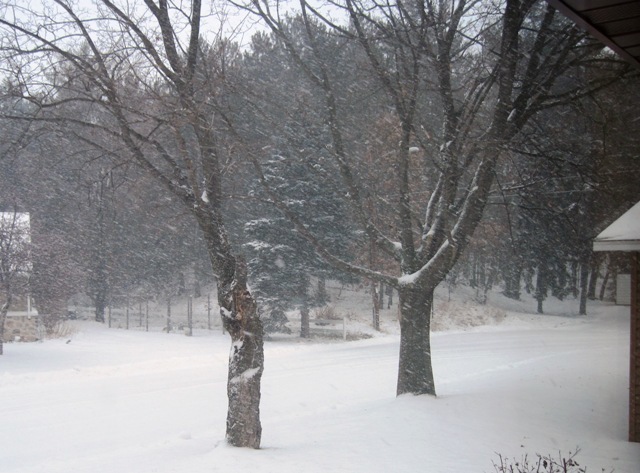 The itty bitty snowflakes softly falling all day long covered Rhinelander in a blanket of snow. Green Girl in Wisconsin surprised me with my third give away win in one week. 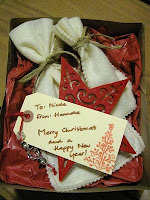 I can pick out any gift I want from Anne Marie's NaDa Farm Shop. That bank bag has my name on it. Thank you, Green Girl and Anne Marie! At yesterday’s Christmas get-together organized by the YMCA's Children's Learning Center Lola would not sing. She has been practicing Christmas songs for weeks with her friends and teachers, but at the sight of all those moms and dads in the audience she was overcome with shyness. I just spit out seventeen seeds from my supposedly seedless clementine. It was very sweet though. Any sweet surprises for you this week? Many summers ago, I visited the small town of Patara in Turkey. Lonely Planet describes it as “scruffy,” a title that suits the town very well. There are few tourists to be found there, the people are friendly, the beach is stunning, and the archeological dig site is quiet and fascinating. It is also the birth place of Saint Nicholas. 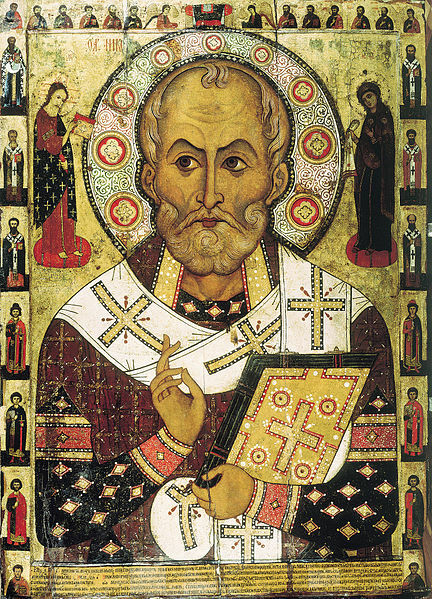 As an adult Nicholas became the bishop of nearby Myra in Lycia, where he died on December 6, 346 AD. He was known for his kindness and secret gift giving, such as placing coins in the shoes of people that left them out for him. His acts of generosity inspired the myth of Sinterklaas as he is known to the Dutch, or Santa Claus as we know him here in the Untied States. 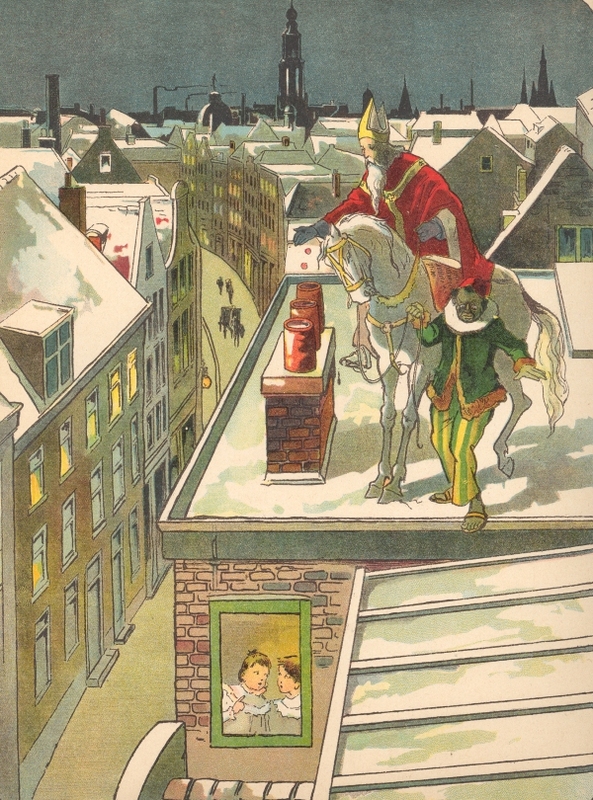 Dutch tradition has Sinterklaas scaling rooftops on his horse on December 5th, Saint Nicholas Eve, leaving gifts behind in children’s shoes set out by the fireplace. Children leave drawings in their shoes for Sinterklaas, and carrots, straw and water for his horse. His helpers are Black Piets, black because of the chimney soot, merry gentlemen much like Santa Claus’s elves. Over the years, Sinterklaas has become a snowbird, moving to warmer Spain where he spends most of his days. 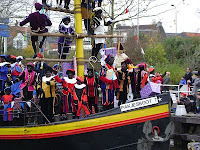 Around mid November he arrives by boat, an event nationally televised. Rain or shine, thousands of young and old believers flock to the harbor to welcome him to Holland. Whenever I stumbled upon Sinterklaas’s arrival in later years, I instantly became a believer again. I am to this day. When Dutch and English immigrants arrived in America, they brought Sinterklaas and Father Christmas with them, and eventually the two merged into one. Clement Clarke Moore’s poem “A Visit from St. Nicholas” (‘Twas the night before Christmas…) was the first to introduce Santa’s sleigh with reindeer and the man himself as jolly and slightly chubby, an image immortalized by the Coca Cola Company in later years. 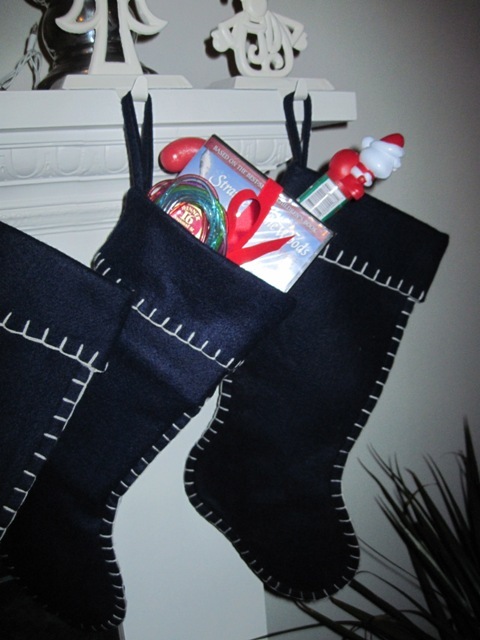 Tonight is Sinterklaas Eve, and my friends and family in Holland are all celebrating and exchanging gifts. I read on Green Girl in Wisconsin’s blog that Sinterklaas is celebrated in certain areas of Wisconsin, due to the large numbers of Dutch living there. As much as I like the thought, it will not be the case in Rhinelander tonight. 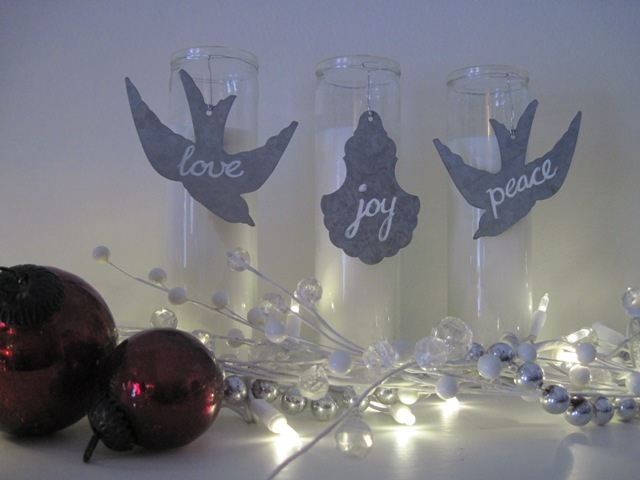 We're sticking to one gift giver for now, peace on earth, and goodwill towards men. I have a confession to make. I don't believe in a Jury of Your Peers. Two, three hundred years ago, sure. But the United States have evolved into a different country since then and its laws have evolved with it. They are more complex than ever and to become an expert of the law is a long and expensive process. Yet every trial is conducted in front of a jury made up of people with a rudimentary knowledge of the law. In my opinion trials by jury invite emotions into a courtroom and lawyers that pray on those emotions. The law, unfortunately, is not about justice. It is far too complicated to be left to laymen. Not to mention the inconvenience of being pulled away from one's daily tasks to serve on a jury. I am sure if jurors wanted to spend more time in a courtroom they would have either studied the law or broken it. My personal opinion notwithstanding, I was very excited to find a letter yesterday, telling me I am being considered as a prospective juror in the Forest County Court. All that is asked of me at this point is to fill out a short questionnaire to determine my eligibility. Needless to say, I flunked the test. I am not a US citizen, nor am I a Forest County citizen. Therefore, I can never be one of your peers. The Christmas lights came on in Crandon tonight. And just like last year, the town folk gathered in the square, caroled their way to Dr. Perry's house to admire her Christmas display and visited with Santa Claus afterwards whilst enjoying a cup of hot chocolate and a cookie. Lola wasn't as shy with Santa and Mrs. Claus this time. She sat on Santa's lap and told him all about the purple suitcase she wants. When she couldn't think of anything else, Santa advised her to write him a note and leave it out for him. Something she immediately set out to do when she got home. Unlike last year, Ryan was with us this time. He missed out on the fun a year ago because he was still in Washington, packing up the barn. It was good to have all of us there. And this is one tradition Lola definitely loves to be a part of. Her Jingle Bells was heard loud and clear through the cold wintery night. It's beginning to look alot like Christmas! 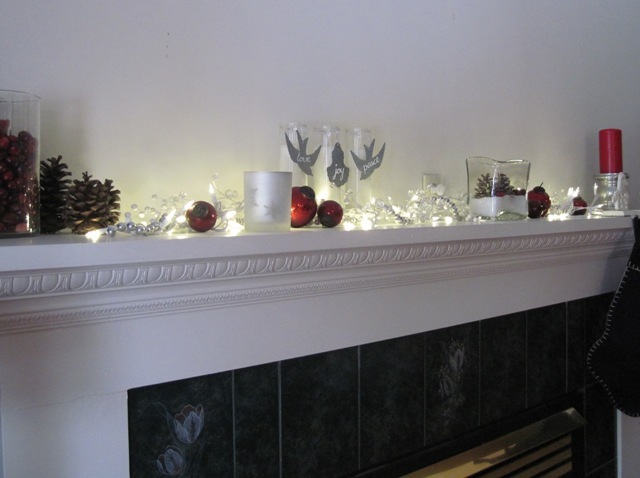 The seasonal spirit has taken a firm hold on our household. Ryan and I both want to create family memories and traditions of our own that Lola can look back on some day with a smile on her face and happiness in her heart. I am not sure if she's catching on, though. When we went to the Christmas Tree Farm to pick out our tree, the adults were almost skipping along, very much enjoying the experience. But Lola? She just wanted to go home, she was cold. 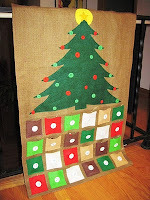 And I have been sewing up a storm to finish my Advent Calender in time for the first of December. Bursting with pride, I presented the finished product to Lola this morning and told her she could take one ornament from a pocket every day to hang on the tree and when all the ornaments are hung, it will be Christmas! "Go ahead," I said, "hang the first one." Her response? "Uhm, maybe tomorrow..."
﻿﻿﻿﻿Today all the participants in Craftaholics Anonymous' Handmade Holiday Gift Exchange reveal their gifts. Here's a peek inside my brown paper package. Wrapping the presents I made for my handmade holiday gift exchange partner Nicole was just as much fun as making them. I sewed two white felt bags to hold the goodies, which I did tie with string, and made a gift tag with some odds and ends found in the great big bin marked "X-MAS" that inconveniently sits in the middle of my craft room. Inside the bags are a necklace, earrings, and a crystal ornament. 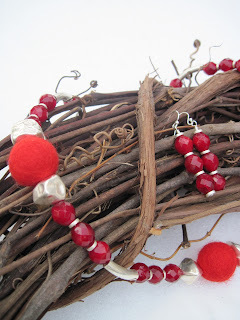 I did not have red in mind when I set out to make the necklace, but as so often happens, the piece made itself. All I did was find the right order for the beads. I took Nicole's gifts outside to make some pictures. 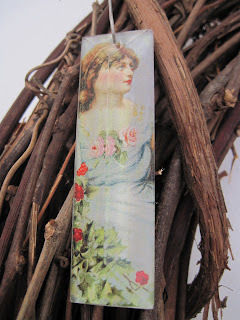 I love the vibrant red on the grapevine wreath in the snow. 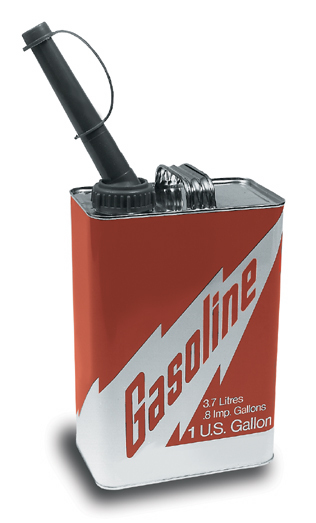 I hope Nicole likes her gifts. And I cannot wait to see what she made for me!